Pacing from side to side, the glowing candles surrounding the King bobbed and weaved around his head. Elegiac stopped pacing for a moment to glance out the window at the setting sun, then resumed with even more frantic intensity. His tail lashed from side to side, timed with his agitated muttering. "Where is he. Where is he!" Elegiac spun around at a quiet knock at the tall oaken door guarding his simply decorated quarters. He quickly crossed the room, throwing open the door. "Mel?" Instead of a Coatl a Bogsneak stood in the hall, the cloak he wore covering his eyes. "Oh. Never-mind." The king turned around, and Paris was forced to speak to his back. "Sir? There's been no sign of him." Elegiac sighed gazing out of the window into the twilight-covered forest. "I figured." Paris dropped his head, knowing the pain his King was going through. "I will tell my men to keep searching, Sir. We won't stop until we find him." Elegiac waved a tired hand behind him. "No. Your men deserve rest. They have been out for over three Moons, and I'm sure they are tired." "Please." He turned around, looking Paris in the eyes. "We will continue searching in the morning. Until then, tell your men to get some sleep." The tall Bogsneak bowed his head, his eyes filed with gratitude. "Thank you Sir. You're a good man." El smiled, but Paris heard the sigh of an exhausted man as he turned back towards the window. Night was falling fast, and stars were beginning to appear. "Goodnight, Sir." The door closed softly behind him as Paris left the room. "Goodnight." Elegiac whispered softly to himself as he fought back the tears that threatened to break the entire brave facade he had been holding throughout the past three days. He sat down, staring at his paws. They were the scar covered hands of a warrior, combined with the deep creases of a worried man. He remembered what it was like to lose someone he cared about, and Elegiac knew he could never let that happen again. Suddenly, he stood up. Stepping over his sleeping familiar, he threw off his heavy winter cloak that he wore to bed and stepped toward the window. The glass was cold as he pressed his palms firmly to the window and pushed out, throwing them open. A cool winter breeze instantly blew through the room, and Elegiac shivered. Letting the thoughts of his lover in danger warm him, the Coatl leapt from the window and fell through the night air before stretching out his wings and soaring through the sky. Back at the tower, Paris was delivering the good news to his exhausted men. "The King has graciously let us retire tonight and resume our searching in the morning." The room full of all sorts of dragons nodded and smiled, their tired eyes speaking more than they were. However, some dragons seemed unhappy with this, and grumbled to themselves. Paris snarled, striding up towards them. The entire room fell silent as Paris stared down a Skydancer. "Do you have a problem with that?" The Skydancer looked scared for a moment, but then lashed out again. "Why should we take orders from a stupid King who doesn't even own a kingdom any more? Why couldn't we have stopped last night, or the night before that?" He paused for breath, but stopped when he saw the look in Paris's eyes. The usually placid Bogsneak held an expression of such fury behind his icy eyes that the whole room shifted uncomfortably. "You dare talk against our King?" His voice was a deadly whisper as he stared into the Skydancer's eyes. Paris reared his head back, getting up on his back legs. "Because if this man's insolence, we are no longer taking a rest day. Everyone, fill up your lanterns because we are resuming our search, effective immediately. All of the dragons were stunned, realizing Paris was serious. The entire room filled with outrage, but not directed at Paris. The Skydancer that had dared to defy Captain, insulted the King, and made them continue searching without rest was attacked by over 50 men. Paris narrowed his eyes, before strapping his Venom-laced bracers on. "Let's go boys. We're goin' dragon hunting." He growled, before taking to the skies. "Mel?" Elegiac called, hsi voice hoarse after hours of fruitless searching on the dark. The usually familiar forest felt foreign in the darkness, and the King felt lost without his partner. "Mel?" Suddenly, a twig snapped behind him. Elegiac whirled around, his lantern spinning. "Who's there?" He demanded, shoving the oil lantern forward. "Show yourself!" "Sir?" A familiar voice emerged from the hulking darkness, and El recoiled in shock. The Bogsneak stepped into the light, and Elegiac recognized the leaf-laden cloak wrapped around his neck. "What are you doing? I thought I gave you a night to rest?" Paris chuckled, and explained what happened in the tower. Elegiac laughed, but soon grew serious remembering why he was in the forest. "Although I don't like over-working your men, I am thankful for your company in searching." Elegiac responded, before turning back to the trees. "Shall we?" Paris nodded, and joined him in calling out Melancholia's name. Hours passed, and nothing had changed. Elegiac's voice was hoarse, and the dark circles under Paris's eyes deepened. Finally, just as they were about to give up, a scream rose from deeper into the forest. The two dragons raced towards the location, Elegiac bursting ahead with the adrenaline of ending the search. The two arrived at a large clearing in the center of the forest. Elegiac cautiously stepped forward out of the trees, despite the insistence of Paris telling him to wait. "Mel?" He called out tentatively, stepping forward slowly. "E-el..." A weak voice whispered from the center of the clearing. It came from under a large rock that had been hollowed out on the opposite side. "P-please... help..."
Elegiac's breathing quickened. He recognized the voice of his boyfriend, Melancholia! "Mel!" He ran around the rock, but stopped dead in his tracks when he saw the beautiful Coatl he loved lying on the ground, with thousands of spectral hands holding him anchored to the floor. A screech suddenly shook him out of his shock, and Elegiac roared in pain as a large, and Mimic burst from inside the rock's shadows and tore down Elegiac's wing. Paris, who stayed back, ran forward to protect his king. He lashed out at the Mimic, smashing it with his tail. The angry mimic skidded backwards, before bounding forwards with increased fury. Elegiac pushed past his pain, and, in a swift move, broke the lantern over the Mimic's head, engulfing it in flames. It gave an ear-piercing screech before dissipating into a cold mist. Melancholia's eyes opened wide, and his mouth fell open as the hands emerged from him before disappearing as well. Elegiac fell on the ground, hugging Mel tightly. "Thank you." Melancholia's eyes welled up with tears, and embraced Elegiac. Paris smiled, his head tilting as he saw how much the two dragons loved each other. After everyone gathered the strength to fly back, all three dragons slept well into midday. And that is the story of how the Lair of Blinding Star defeated the Mimic. [url=http://flightrising.com/main.php?dragon=16057010] [img]http://flightrising.com/rendern/350/160571/16057010_350.png[/img] [/url] Pyre's body blazed with rage. "I'll burn everything to the ground to find who's responsible," the newly-appointed clan leader snarled. [url=http://flightrising.com/main.php?dragon=4297636] [img]http://flightrising.com/rendern/350/42977/4297636_350.png[/img] [/url] "Erm, do we really have to worry? 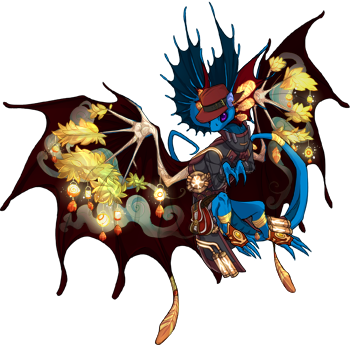 We only have one nocturne in our clan and, well, she's a baby..." said Rotsire, adjusting his goggles. 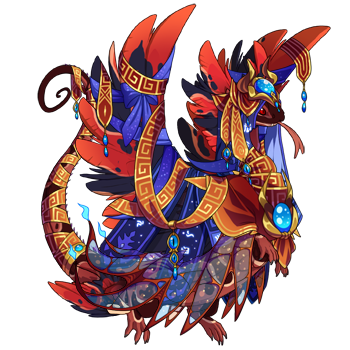 [url=http://flightrising.com/main.php?dragon=3164254] [img]http://flightrising.com/rendern/350/31643/3164254_350.png[/img] [/url] "It should be her then," the old woman, Taxes, crowed. Pyre grabbed the sleeping nocturne, with a paw big enough to engulf the little one, and shook ferociously. Phlebotomy was jolted from her slumber. "Where'd you hide the thing? What valuable thing did you put in our lair?" "Huh? I didn't hide anything... I just saw my old friend, Mulligan, and let him in..." said the little girl. She was dangling from the Imperial's paw. "I miss our old clanmates..." she said dreadfully. And in fact, Mulligan had come to visit, and had released the mimic into the lair. Pyre chased it away with fire. Pyre's body blazed with rage. "I'll burn everything to the ground to find who's responsible," the newly-appointed clan leader snarled. "Erm, do we really have to worry? 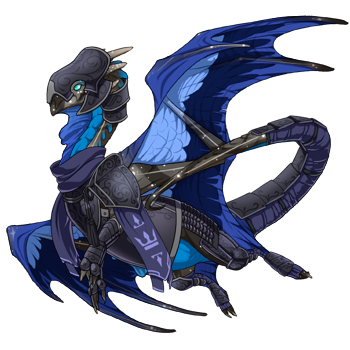 We only have one nocturne in our clan and, well, she's a baby..." said Rotsire, adjusting his goggles. "It should be her then," the old woman, Taxes, crowed. Pyre grabbed the sleeping nocturne, with a paw big enough to engulf the little one, and shook ferociously. Phlebotomy was jolted from her slumber. "Where'd you hide the thing? What valuable thing did you put in our lair?" "Huh? I didn't hide anything... I just saw my old friend, Mulligan, and let him in..." said the little girl. She was dangling from the Imperial's paw. "I miss our old clanmates..." she said dreadfully. And in fact, Mulligan had come to visit, and had released the mimic into the lair. Pyre chased it away with fire. 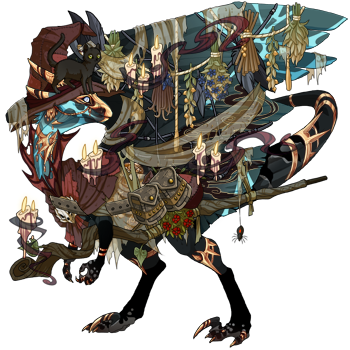 [url=http://flightrising.com/main.php?dragon=3872994] [img]http://flightrising.com/rendern/350/38730/3872994_350.png[/img] [/url] Courtesy, clan co-founder and mate of Dawnfire, snuffled and wept over his poor battered love, fins crumpled in his misery. There would be no help from him tonight. 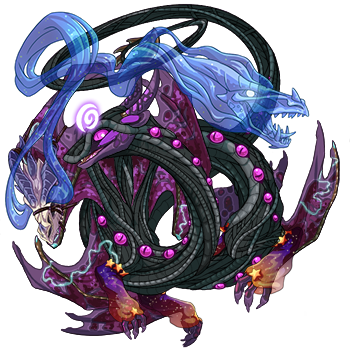 [url=http://flightrising.com/main.php?dragon=6695621] [img]http://flightrising.com/rendern/350/66957/6695621_350.png[/img] [/url] "Elessar, the wanderer. Who else might bring strange treasures home?" Bergamot hissed to Calabria. The paladin and cleric had made their founders comfortable before leaving to search for the dusty Snapper, and together they climbed the mountain, higher and higher, all the way to Attachment's cavern near the very top. Elessar always stayed here during The Night, there was no better place to search! 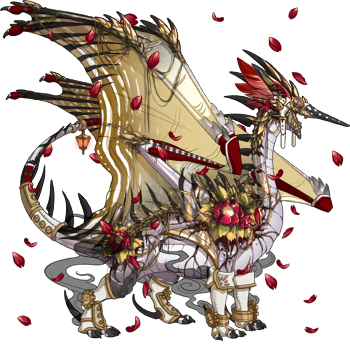 [url=http://flightrising.com/main.php?dragon=7610939] [img]http://flightrising.com/rendern/350/76110/7610939_350.png[/img] [/url] The rosy hued witch blinked at them, then smiled weakly. The mimic, chest-like and snarling, was trapped in a strange runic circle, battering against the fiery barrier that visibly dimmed after every hit, and Elessar lay unconscious further into the small cavern. "I've been holding it since she got here. Not too long, but I'm no great shakes at barriers, heh...in fact, it's about to get out. Are you ready to fight?" Oh. Oh they were [i]very[/i] ready. That mimic didn't stand a [i]chance. [/i] And then Atta brewed up a lot of ointments, because the little jerk was a biter. Ow. Courtesy, clan co-founder and mate of Dawnfire, snuffled and wept over his poor battered love, fins crumpled in his misery. There would be no help from him tonight. "Elessar, the wanderer. Who else might bring strange treasures home?" Bergamot hissed to Calabria. The paladin and cleric had made their founders comfortable before leaving to search for the dusty Snapper, and together they climbed the mountain, higher and higher, all the way to Attachment's cavern near the very top. Elessar always stayed here during The Night, there was no better place to search! The rosy hued witch blinked at them, then smiled weakly. The mimic, chest-like and snarling, was trapped in a strange runic circle, battering against the fiery barrier that visibly dimmed after every hit, and Elessar lay unconscious further into the small cavern. "I've been holding it since she got here. Not too long, but I'm no great shakes at barriers, heh...in fact, it's about to get out. Are you ready to fight?" Oh. Oh they were very ready. That mimic didn't stand a chance. And then Atta brewed up a lot of ointments, because the little jerk was a biter. Ow. FOUR YEARS AND COUNTING, BABY! "Heh... Not the friendliest guy, huh?" 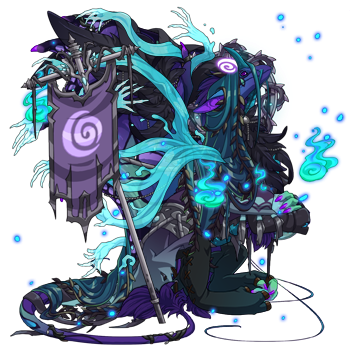 The voice that spoke first after the ordeal was the voice of the charismatic mercenary- [center][url=http://flightrising.com/main.php?dragon=36481400] [img]http://flightrising.com/rendern/350/364815/36481400_350.png[/img] [/url][/center] -[b]Vitra[/b]. He was trying to lighten the mood, but how could he? Lavaburst City, the city that aided he and his mercenary band... the sunlit city that always knew how to pull forward. Vitra could hardly believe that same city was crumbling. And all because of a mimic. He didn't know if his mercenary band, the Sunforge, were okay. "'Not the friendliest guy?" came the second voice, growling and haughty. 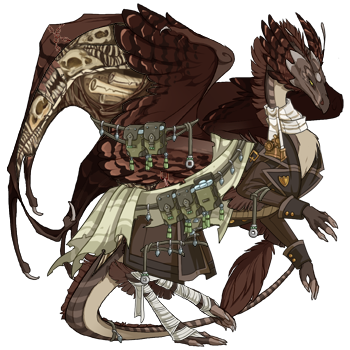 "That was [url=http://flightrising.com/main.php?p=lair&id=260757&tab=dragon&did=33139981]Alibi's son[/url]." "Mm. I've got no idea who Alibi is," Vitra flashed one of his signature fake smiles at the second dragon, who scowled. "[i]Hey. [/i] You watch your tone with me, mercenary," The second dragon loomed over him, her eyes narrowed. The two Skydancers were nearly face to face. "You know who I am, correct?" 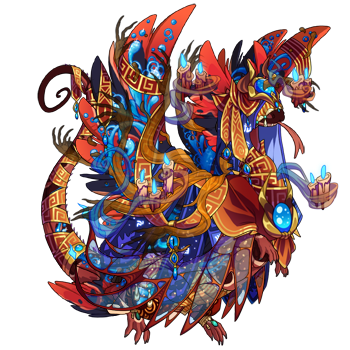 [url=http://flightrising.com/main.php?dragon=27884811] [img]http://flightrising.com/rendern/350/278849/27884811_350.png[/img] [/url] "Oh yes, of course." Vitra held her gaze, unwavering. "Who isn't familiar with [b]Maeve[/b], the spymaster? Yes, I am so familiar with all your work of infiltration, stealing, and-" "HEY! I told you to watch your tone!" Maeve snarled, her eyes slits as they furiously bore into Vitra's eyes. "I am a member of the First Sphere-" "Please. Be quiet." The monotone voice came not from a Fae, but a giant Imperial. She had just finished tying the Nocturne to a tree. 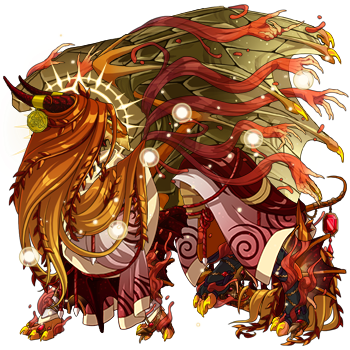 [url=http://flightrising.com/main.php?dragon=29316383] [img]http://flightrising.com/rendern/350/293164/29316383_350.png[/img] [/url] When the two each gave her a look, she shrugged. "He will be able to free himself when he regains his senses. That is, if we are able to stop the mimic." Vitra grinned again. "Ah, who would expect a bounty hunter, [b]Leora[/b] herself, to be some calm and rational. I diiiidn't. Before I met you, two seconds ago, I expected you to be all bared teeth and sharp claws." "Tch, how rude!" Maeve had returned to glaring at Vitra. "Were you raised by wolves?" "Enough." Leora looked down at the feuding Skydancers. "I feel like there's a reason that all three of us were sent here, why we're together like this." "Oh? Do tell." said Vitra, who was inspecting his glowing claws. "We all share incredible mastery over our magic." The bounty hunter went on. "Granted, they can all be divided into the categories of offensive, defensive, and utility, but we are all powerful magic users." "Then maybe, magic is our group's greatest asset?" Maeve spoke quietly, as though she was deep in thought. "Aw, darn. That means we'll have to work togetherrrr." Vitra whined, his face baring an impish grin. "Listen. I have an idea regarding how we might locate the mimic," Leora explained, her voice monotone even with the gravity of their situation. "But you are both going to have to cooperate. Not just with me, but with each other." There was a pause, an exchanging of agitated glances and a scoff, before Leora continued. "Are you in?" Vitra faked a deep, long sigh. "Fiiiiiiiiine! But only because I have to." He spoke in an exaggerated, exasperated tone. "On a normal day, I'd hate our little miss spy... but just this once..!!" "You've... only just met me though..." Maeve stopped herself, then groaned. "Sure, whatever. I'm in." A brief smile graced Leora's snout. "Good. So here's how this is going to go..."
"Heh... Not the friendliest guy, huh?" -Vitra. He was trying to lighten the mood, but how could he? Lavaburst City, the city that aided he and his mercenary band... the sunlit city that always knew how to pull forward. Vitra could hardly believe that same city was crumbling. And all because of a mimic. He didn't know if his mercenary band, the Sunforge, were okay. "'Not the friendliest guy?" came the second voice, growling and haughty. "That was Alibi's son." "Mm. I've got no idea who Alibi is," Vitra flashed one of his signature fake smiles at the second dragon, who scowled. "Hey. You watch your tone with me, mercenary," The second dragon loomed over him, her eyes narrowed. The two Skydancers were nearly face to face. "You know who I am, correct?" "Oh yes, of course." Vitra held her gaze, unwavering. "Who isn't familiar with Maeve, the spymaster? Yes, I am so familiar with all your work of infiltration, stealing, and-"
"HEY! I told you to watch your tone!" Maeve snarled, her eyes slits as they furiously bore into Vitra's eyes. "I am a member of the First Sphere-"
The monotone voice came not from a Fae, but a giant Imperial. She had just finished tying the Nocturne to a tree. When the two each gave her a look, she shrugged. "He will be able to free himself when he regains his senses. That is, if we are able to stop the mimic." Vitra grinned again. "Ah, who would expect a bounty hunter, Leora herself, to be some calm and rational. I diiiidn't. Before I met you, two seconds ago, I expected you to be all bared teeth and sharp claws." "Tch, how rude!" Maeve had returned to glaring at Vitra. "Were you raised by wolves?" "Enough." Leora looked down at the feuding Skydancers. "I feel like there's a reason that all three of us were sent here, why we're together like this." "Oh? Do tell." said Vitra, who was inspecting his glowing claws. "We all share incredible mastery over our magic." The bounty hunter went on. "Granted, they can all be divided into the categories of offensive, defensive, and utility, but we are all powerful magic users." "Then maybe, magic is our group's greatest asset?" Maeve spoke quietly, as though she was deep in thought. "Aw, darn. That means we'll have to work togetherrrr." Vitra whined, his face baring an impish grin. "Listen. I have an idea regarding how we might locate the mimic," Leora explained, her voice monotone even with the gravity of their situation. "But you are both going to have to cooperate. Not just with me, but with each other." There was a pause, an exchanging of agitated glances and a scoff, before Leora continued. Vitra faked a deep, long sigh. "Fiiiiiiiiine! But only because I have to." He spoke in an exaggerated, exasperated tone. "On a normal day, I'd hate our little miss spy... but just this once..!!" "You've... only just met me though..." Maeve stopped herself, then groaned. "Sure, whatever. I'm in." A brief smile graced Leora's snout. "Good. So here's how this is going to go..."
Tavurth the skilled fortune teller and leader of a cult within the Guild of the Royal Fauna. 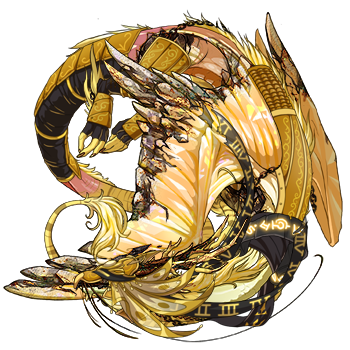 He's extremely adept at predicting the future but not very often for the same dragons and is often quickly exhausted by his abilities. Another fun fact, despite his thick coat of fur he gets cold easily and finds he needs to either bask in the sun or sit by a fire for a period of time. Isana the warrior magician. He loves slight-of-hand tricks but also enjoys minor illusions that can slightly distort the reality of other dragons for a bit. You might've noticed the odd title of "Warrior Magician", and there's a reason for it. His magic, though potent when used correctly, doesn't last very long and he doesn't have much magic power in general so he relies more on physical strength. Outside of being a warrior, however, he is a bit of a trickster. Alnilam the awkward, standoffish flower lover. He's really there for the ride and to provide moral support as he is the leader of the cult both Isana and Tavurth are a part of. He might be a leader, but he's more of the "brood in the corner and admire the flowers you've grown for years" type rather than the "plot the destruction of an entire civilization from the shadows." Not that... anyone would want to do that..... right? Alnilam gently knelt next to the wilted flowers sitting in the ruined dome of crumbled plants and earth. One of the Royal Fauna, the heavily guarded secret of the guild that once was, unsurprisingly named after the flowers they settled around. One he was a part of. It happened suddenly, one day everything devolved into utter chaos. He felt saddened that he'd never hear the soft call of the flowers and felt a deep void. He longed for his friends.. his family.. but they were all dead or maimed, left crippled by the incident. He thought back to that day. The day that ruined his life. The day that claimed the lives of what might as well have been an entire guild and then some. Some merchants came through one day. No one thought anything of it, in fact they were quite polite. They provided interesting looking chests that could be locked with a spoken code for an interestingly cheap price. If anything, it was far too normal. In all honesty, he wasn't there to see any of it go down. Alnilam returned to the damage after visiting the guild's light hub to pick flowers. Almost overnight the flourishing empire was reduced to mere rubble. He got the entire story from Isana. Isana, unsurprisingly as a member of the royal guard, was one of the first to respond to the cries of fright from one of the lair's trees. A familiar dragon greeted him, it's tongue dripping in saliva as it stared hungrily at the small fae being guarded by its familiar. He quickly cast a disorienting illusion before flying forward as fast as his wings could carry him and slammed his body against the dragon, Aedus, effectively knocking him out. He quickly fell and he turned to the frightened dragon, "Are you alright?" His eyes were filled with concern. The fae quickly squeaked out a reassuring squeak, though it didn't do much to quell his fears. The spiral swiftly flew from the tree he was in and rose into the air, getting a decent vantage point, "By Earthshaker's beard.... what's happening??" He nearly screamed at the sight. He knew there was no way he'd be able to reach all of these dragons. Nocturnes flooded the streets, sinking their teeth into anything they could. Their eyes were all clouded as if something was possessing them. Blood spattered everywhere, staining the ground and plants a horrid crimson. His eyes danced wildly, a feeling of powerless settling over him as he watched his guildmates, no, his family die right in front of him. He quickly snapped out of it and flew to someone he knew would be able to help. "Oarae.. I have to find... Oarae." He flew as fast as he physically could, dodging and weaving over the masses of chests surging upwards at him, "Oarae! I need you.. to set up a perimeter. I don't care if we're stuck in here forever, we can't.. we can't let them get any.. further." He said as he began to catch his breath. "You're a bit late. It's already up, but I don't know how long it'll last. You need to go through and knock some sense into them. At this rate, the guild... we're not going to last." She furrowed her brows with concern. "I don't know what's going on, but it all started after those merchants sold those chests." Suddenly, it hit him, "Now I know... Gods, I should've seen this earlier. It's a mimic. Damn it.. we should've known." He cursed himself silently. "Those chests, they sold tons of them. One of those must have been a mimic. Around this time of year, they.. they do something weird to Nocturnes... which is a slight problem considering the number of Nocturnes in the lair." "So how do we deal with that?" "Tavurth. Are you really over dramatizing the Night of the Nocturne incident to get more clients?" Isana looked unimpressed as he poked his head into the fortune teller's tent. "Uhh.... no?" Tavurth lied with a sheepish smile. "Okay, maybe, but business has been slow today... wait, no come back!" He shouted to his client who quickly turned and stalked out of the door, grumbling about him being a scammer. "I swear I'm a real fortune teller!" Isana rolled his eyes and continued down the road. His smooth gait shimmered and was replaced by his real appearance. He was reduced to a limp as his front right arm was replaced by a stump, covered in scar tissue. He winced as he tripped forward a step, ignoring the pain as he hobbled up to the ruined dome he knew he'd find Alnilam sitting in, mourning dead flowers and dead guild mates. "You really told, and helped, Oarae put up that memory blocking spell, huh?" Alnilam asked as he heard him walk up. "Yep, and it'll stay that way forever." Isana said, staring at the dead Royal Fauna in the dome. "We've restored enough that they don't question it anymore though.... it'll.. it'll all be fine." The look in his eyes said otherwise. These three ladies agree emphatically that they are not talking about what occurred. They just want to say it was a very long night, and WhitePeace's candy caramel trap was useful if very much not appreciated. 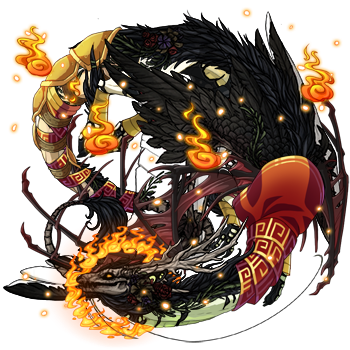 [url=http://flightrising.com/main.php?dragon=46843759] [img]http://flightrising.com/rendern/350/468438/46843759_350.png[/img] [/url] Alleya is a rogue, that occasionally serves as an assassin. She is a drifter, and has seen many things in her time. She's dealt with mimics before, so her skills and knowledge of them will come in use. 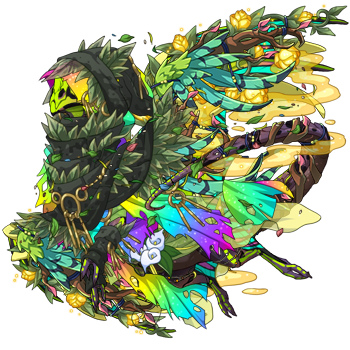 [url=http://flightrising.com/main.php?dragon=47489893] [img]http://flightrising.com/rendern/350/474899/47489893_350.png[/img] [/url] Newt, an expert with beasts of all kinds, but not really good with other dragons, if anyone is able to subdue this mimic, it be him. [url=http://flightrising.com/main.php?dragon=47187075] [img]http://flightrising.com/rendern/350/471871/47187075_350.png[/img] [/url] Blaise is a powerful mystic, but a bit of a nervous mess. They are good at telling the difference between things, and they should be able to know what the mimic actually is. ----- [i]The mimic was brought in by the 'adventurer' Malkos, and it was quick to act on the unsuspecting clan. First to fall was obviously Malkos, then it worked its up quickly, next the Queen and King, then the founders, then the flight ambassadors, until everyone but Alleya, Newt, and Blaise, were all left. Finding the mimic was a slow process, Lightcrest wasn't a small place after all. But they eventually found the mimic within the home of Malkos, and it was a long battle with all three close to death before eventually it fell, and freeing their clanmates from its grasp. Alleya is a rogue, that occasionally serves as an assassin. She is a drifter, and has seen many things in her time. She's dealt with mimics before, so her skills and knowledge of them will come in use. Newt, an expert with beasts of all kinds, but not really good with other dragons, if anyone is able to subdue this mimic, it be him. Blaise is a powerful mystic, but a bit of a nervous mess. They are good at telling the difference between things, and they should be able to know what the mimic actually is. The mimic was brought in by the 'adventurer' Malkos, and it was quick to act on the unsuspecting clan. First to fall was obviously Malkos, then it worked its up quickly, next the Queen and King, then the founders, then the flight ambassadors, until everyone but Alleya, Newt, and Blaise, were all left. Finding the mimic was a slow process, Lightcrest wasn't a small place after all. But they eventually found the mimic within the home of Malkos, and it was a long battle with all three close to death before eventually it fell, and freeing their clanmates from its grasp. Their clans has fallen to a curse, suffered to them death. Three of them, a rogue witch, a shadow witch and a summoner searched the cause of the curse. When they find it, they're faced against the Mimic, seen impossible to defeat. All of them gathered their strenght and fighted for hours with the mimic, but slowly out of the power. The mimic start to attack them, but in the last few moments with her last power Yirievl made a shield around themselves. -I can't hold much... longer. Gather your last power!- she said, while her voice trembling in the holding of the shield. Other two female gathered up their last magic to kill the mimic. With the hard trying finally, but weak, they defeated the monster of darkness. Corrupted witch who can see the mimics due to her corruption. Adventurer/sorcerer who is trying to free Astoria, his friend and companion. Adventurer/barbarian who is keeping Aeson from getting killed. [i][/i][img]https://i.imgur.com/Mw12kQc.png[/img] "I....oh dear.." Shadowsting mused to herself. She was a skilled witch. These sorts of things never happen anymore...not since the accident in the auction house...all those hatchlings... "Hoctare! What have you brought me? You said I could control it!" The Deathseeker's eye glowed menacingly, a dry laugh escaping its beak. [i]hehehehehe[/i] "No..no..this is all wrong..." She stared scornfully at the enchanted spellbook, flapping it's wings against the bars of the cage she had stuffed it into, one wing slightly ruffled. Her beloved Hoctare...her entire clan....there was only one dragon who could help her. [img]https://i.imgur.com/cauql9h.png[/img] Tiefling eyed the Mimic carefully. "I see...yes...that certainly is a problem. It's a Mimic. If you even were able to force it open enough to read it there would be nothing but gibberish qnd backwards spells." The Alchemist leveled a gaze at Shadowsting. "This is powerful dark magic. From the lair of the Shadowbinder himself. I can try to...Alter it...make it obey or at least render it's influence over the clan moot..." The Imperial nodded enthusiastically. "I want to know it's secrets...I want to know why my...my mate...." [img]https://i.imgur.com/iS98KgB.png[/img] The Nocturne groaned and tensed under the dark glittering fog of the season, the pull of dark magic heavy on his mind. He was not a sorcerer....he was a soldier. "My...My love!" He cried out, writhing in pain. "Help me! Help me!" [i]"Do you wish to be free of your torment? "[/i] A sinister voice echoed in his head. "Oh divines yes! Please....PLEASE!" [i]"Kill the witch. Kill the witch and rip out her heart. And the alchemist. Strangle him with that damned amulet! "[/i] the voice hissed. Nightwish shook his head. "No...NO! I...I CAN'T! They're...my...family..." [i]"Family? "[/i] The voice scoffed. [i]"Your kind doesn't HAVE Family. You are the Shadowbinder's slaves..alone and tormented. "[/i] Nightwish fought the fog harder. "No...I'm...Not!" "No..no..this is all wrong..." She stared scornfully at the enchanted spellbook, flapping it's wings against the bars of the cage she had stuffed it into, one wing slightly ruffled. 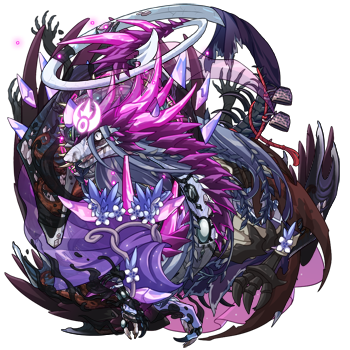 Her beloved Hoctare...her entire clan....there was only one dragon who could help her. Tiefling eyed the Mimic carefully. "I see...yes...that certainly is a problem. It's a Mimic. If you even were able to force it open enough to read it there would be nothing but gibberish qnd backwards spells." The Alchemist leveled a gaze at Shadowsting. "This is powerful dark magic. From the lair of the Shadowbinder himself. I can try to...Alter it...make it obey or at least render it's influence over the clan moot..." The Imperial nodded enthusiastically. "I want to know it's secrets...I want to know why my...my mate...."
The Nocturne groaned and tensed under the dark glittering fog of the season, the pull of dark magic heavy on his mind. He was not a sorcerer....he was a soldier. "My...My love!" He cried out, writhing in pain. "Help me! Help me!" "Do you wish to be free of your torment?" A sinister voice echoed in his head. "Kill the witch. Kill the witch and rip out her heart. And the alchemist. Strangle him with that damned amulet!" the voice hissed. Nightwish shook his head. "No...NO! I...I CAN'T! They're...my...family..."
"Family?" The voice scoffed. "Your kind doesn't HAVE Family. You are the Shadowbinder's slaves..alone and tormented." Nightwish fought the fog harder. "No...I'm...Not!"